Here are your travel contests for this week. You can win trips to Riviera Maya, Mexico; Hong Kong; St. Lucia; Tuscany, Italy; New York City; Boston, Massachusetts; Punta Cana, Dominican Republic; Montreal, Quebec, Canada; Cancun, Mexico; Sonoma & Napa, California; Ashland, Oregon; Yosemite National Park; San Francisco, California; Florida; 140,000 Hawaiian Airlines miles; and more. Good luck & be sure to subscribe to the weekly newsletter so you don’t miss any contests! Ancestry will provide two (2) complimentary and free 1-year membership to Ancestry (1 for each recipient) with the World Explorer membership (ARV of $420 USD). Though residents from any country are eligible to receive prize, specific products for Ancestry exist for only the following countries: United States, Canada, United Kingdom, Australia, New Zealand, Sweden, Germany and Mexico. TravelStore will provide up to $3,000 USD ($1,500 USD per person) in travel credit to be used for custom trip planning services provided by TravelStore. Travel credit is eligible to be used for any trip and services that can be arranged and booked by TravelStore. Some restrictions may apply. STA Travel will provide one (1) winner and their one (1) traveling companion with a flight voucher worth up to $3,000 USD ($1,500 USD for each person) for economy class travel, to be used for flights to get the winner and the companion to their destination. Voucher is valid until June 30, 2018. Booking must be confirmed at least four (4) weeks before planned departure. Cannot be combined with other offers. Not valid on ISIC/ITIC/IYTC cards or travel insurance. Non-transferable and cannot be redeemed for cash. Winner must redeem by calling STA Travel at 800.781.4040. Bluesmart will provide two (2) Bluesmart Ones (total worth $898). One per recipient. Not all countries are eligible for shipping. Some restrictions may apply. Lonely Planet will provide up to $100 USD ($50 USD per person) in credit to the Lonely Planet Shop. The Clymb will provide a $250 gift card (1 for each recipient) to shop at https://www.theclymb.com. World Nomads will offer to provide a 2-week Standard plan travel insurance policy from World Nomads.com Pty Ltd. for two travelers traveling on the same itinerary departing/arriving from same departure city. Plan policy premium depends on country of residence. Sponsor will reimburse up to $300 USD. Includes Diamond Club luxury junior suite, plus a 50-minute couples massage ($3,995 value). Buy a new vacation wardrobe or use the money towards your flight! Honeymoon in style with gorgeous accessories from Kendra Scott’s newest resort collection. Win a wine fueled trip to Tuscany. 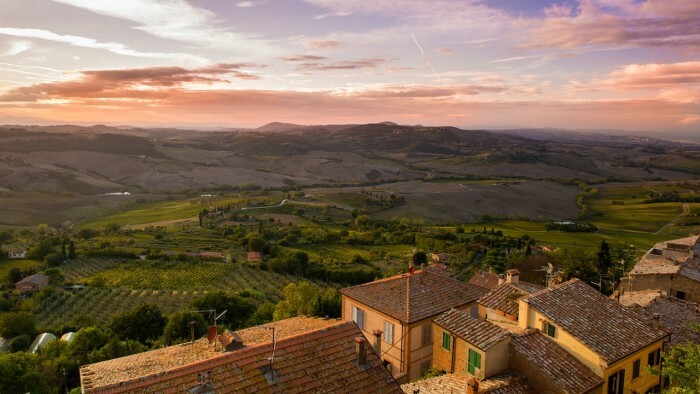 Trip includes round trip flights for 2 from New York to Italy, full accommodations and meals, and plenty of Tuscany’s most famous wine, Nobile. In addition you’ll go truffle hunting with your very own truffle dog and get to drive a Ferrari for 2 hours through the winding Tuscan roads. Depart New York October 31 and return November 5th. Four-night accommodations at CHIC Punta Cana. All-inclusive all meals, beverages, entertainment. Experience Napa – a day to savor the best Napa Valley has to offer. Enjoycomplimentary VIP wine tastings as you tour the iconic caves at Clos Pegase Winery, sip on wines and soak up the whimsy at Swanson Vineyards, and settle in for a taste of Napa Valley at the Girard Napa Valley tasting room in Yountville. 4-night stay for two in a one-bedroom condo at any North West Florida Wyndham Vacation Rental Property. $250 gift certificate, to be used at winner’s discretion.